At the invitation of Minister of State Security of South Africa Dipuo Letsatsi-Duba, Member of the Political Bureau of the CPC Central Committee and Director of the Office of the Foreign Affairs Commission of the CPC Central Committee Yang Jiechi will travel to Durban, South Africa to attend the 8th Meeting of the BRICS High Representatives for Security Issues from June 28 to 29. The Meeting of the BRICS High Representatives for Security Issues is an important platform for BRICS to enhance political and security cooperation. At the 8th Meeting which marks an important prelude to the BRICS Leaders' Summit in Johannesburg, high representatives for security issues from the five BRICS countries will have a robust exchange of views on the international situation, major international and regional issues, and preparations for the BRICS Leaders' Summit in Johannesburg as well as the BRICS cooperation on counter-terrorism, cyber security, peacekeeping operations and on combating transnational organized crimes. 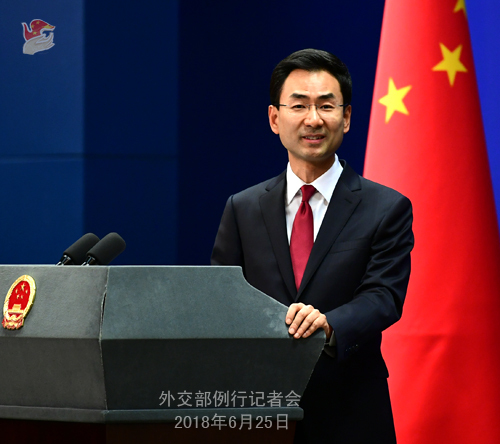 China believes that this meeting will lead to positive results and elevate strategic mutual trust and practical cooperation among the BRICS countries, thus laying a sound political groundwork for the Leaders' Summit in Johannesburg. Q: We have noted that China convened the Central Conference on Work Relating to Foreign Affairs in Beijing last week. What are the most important outcome of this meeting? How will it affect the trajectory of China's major-country diplomacy with Chinese characteristics? 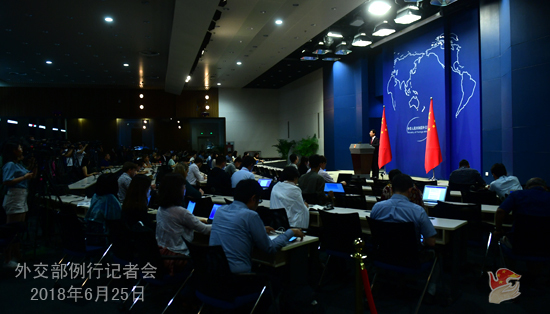 A: The Central Conference on Work Relating to Foreign Affairs which was held in Beijing on June 22 and 23, 2018 reviewed the historic achievements made by China's diplomatic work since the 18th CPC National Congress and answered both theoretically and practically the major question of how to do well the foreign affairs work for the new era. The most important outcome of this meeting is that President Xi Jinping's thought on diplomacy is established as an overarching guideline, providing fundamental principles and action guidance for China to implement the major-country diplomacy with Chinese characteristics. Under the guidance of President Xi Jinping's thought on diplomacy, China's major-country diplomacy with Chinese characteristics will uphold the banner of building a community with a shared future for mankind and help make the global governance system fairer and more reasonable. The development of the Belt and Road Initiative in the principle of wide consultations, joint contributions and shared benefits will be solidified to elevate the country's opening-up to a new level. Major-country relations will be properly handled to forge a framework under which such relations grow in a stable and balanced way. Neighborhood diplomacy will be pursued to ensure a more friendly and favorable neighborhood. Greater solidarity and cooperation will be sought with developing countries for joint progress and common development. China is committed to deepening exchanges and mutual learning with the rest of the world. General Secretary Xi Jinping stressed in the report of the 19th CPC National Congress that the CPC serves not only the happiness of the Chinese people, but also the grand cause of human progress. Under the guidance of President Xi Jinping's thought on diplomacy, the major-country diplomacy with Chinese characteristics will keep in mind both domestic and international imperatives, take promoting national rejuvenation and human progress as the main task, and firmly safeguard the country's sovereignty, security and development interests to ensure that China will always be the architect of world peace, contributor to global development, and champion of international order. The major-country diplomacy with Chinese characteristics will endeavor to build a community with a shared future for mankind, forge a new type of international relations featuring mutual respect, equality, justice and win-win cooperation, and build a clean and beautiful world featuring universal security, common prosperity, openness and inclusiveness. Q: An explosion at a rally in the capital of Ethiopia on June 23 has killed and injured many people. What is China's comment? A: We have noted this blast and condemns such political violence targeting civilians. As a friendly country to Ethiopia, China sincerely hopes that Ethiopia will maintain stability and supports the Ethiopian government's endeavor to uphold solidarity and promote development. Q: We noted that yesterday the Foreign Ministry held a meeting of overseas Chinese envoys to study and act on the spirit of the Central Conference on Work Relating to Foreign Affairs. Do you have more details? 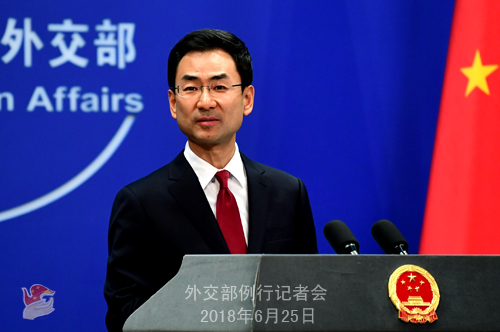 A: Following the Central Conference on Work Relating to Foreign Affairs, the Foreign Ministry immediately held a meeting of Chinese diplomatic envoys on June 24 to study and implement the spirit of that conference, in particular General Secretary Xi Jinping's speech. State Councilor and Foreign Minister Wang Yi attended and addressed the meeting. State Councilor Wang Yi expounded in depth the significance, substance and spirit of President Xi Jinping's thought on diplomacy, urging all Chinese diplomatic envoys and staff to enrich their mind with President Xi Jinping's thought on diplomacy, implement it diligently to guide their daily work, break new grounds in the pursuit of the major-country diplomacy with Chinese characteristics, and make greater new contributions to the realization of the two centenary goals and the Chinese Dream of national rejuvenation under the strong leadership of the CPC Central Committee with Comrade Xi Jinping at its core. Q: There have been some media reports in the US that the Trump administration is preparing investment restrictions on Chinese companies that would like to invest in certain sectors in the US. Do you have comments? A: I would refer you to the competent department for this question. As a Spokesperson for the Foreign Ministry, I want to say that we are following relevant reports. The Chinese government always encourages Chinese enterprises to conduct foreign investment cooperation in accordance with market principles, international rules and local laws. Cooperation between China and the US on trade and investment is for mutual benefit in its nature. Chinese enterprises have created lots of jobs and payed enormous taxes for local American governments. They also brought capital and access to markets for those American companies seeking to expand services overseas. We hope that the US could treat the enterprises' business activities in an objective way and create a sound, fair and predictable investment environment for Chinese enterprises' investment activities. Q: On June 23, in a bomb blast at an election rally in Zimbabwe attended by its President Emmerson Mnangagwa, Vice President Kemo Mohadi, the wife of Vice President Chiwenga and one cabinet minister sustained minor injuries, and three security officers were killed. What is your comment? A: China condemns such political violence. We express our condolences to the victims and sympathy to the injured and the bereaved families. As a friendly nation to Zimbabwe, China sincerely hopes that the forthcoming election in Zimbabwe will proceed smoothly and Zimbabwe will maintain social stability and development. Q: First, do you have more details on the meeting between the Chinese and French leaders? Second, could you talk more about the relevant meeting between China and the EU? A: Regarding your first question, I released the information last week. French Prime Minister Edouard Philippe is on an official visit to China from June 22 to 25. This morning, President Xi Jinping met with Prime Minister Edouard Philippe. We have issued the press release. I believe you have seen that? (The journalist nodded) So I'm not going to repeat it. This afternoon, Premier Li Keqiang will hold talks with Prime Minister Edouard Philippe. Chairman of the Standing Committee of the National People's Congress Li Zhanshu will also meet with him. With regard to these meetings, the Chinese side will release relevant information immediately afterwards, so you may keep following them. As to your second question, China and the EU maintain close exchanges at various levels. We will release information on relevant high-level interactions in a timely manner. Q: Yesterday, the presidential and parliamentary elections were held in Turkey and President Erdogan won the election. What is your comment on this? A: China respects the choice of the Turkish people and congratulates President Recep Tayyip Erdogan on his reelection. China always attaches great importance to its relations with Turkey. Over the recent years, under the guidance of the two heads of state, the bilateral relations and across-the-board cooperation between the two countries have moved ahead and achieved many positive outcomes. China stands ready to work with Turkey to promote greater development of the China-Turkey strategic cooperative relationship for the benefit of the two countries and peoples.